Black and gold is one of the most chic combinations ever. Whenever I spot this combo on a home accessory, I'm all over it. 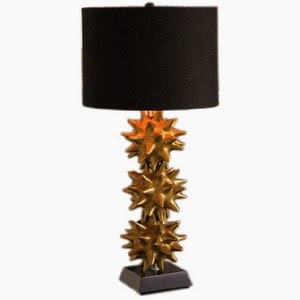 DwellStudio's Urchin Gold Lamp is the perfect example of how well this color scheme works. The lamp's black linen shade is a good balance to the base that makes such a statement. I wouldn't go with a pair of these lamps in a home. Just one on a sidetable is more than enough to add glam to a room.